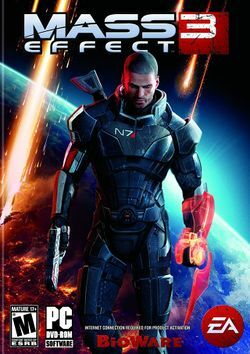 Mass Effect 3 is a 2012 role-playing game/third-person shooter hybrid developed by BioWare for the Xbox 360, Windows, and the PlayStation 3 and published by Electronic Arts. A Wii U version was released in November 2012. The title for the Wii U version comes under the name "Mass Effect 3: Special Edition". The Wii U version contains promotional content like "From the Ashes" showing Javik, the last Prothean as your ally squadmate, extended endings and the comic backstory for anyone new to this game. Following the events of Mass Effect 2 and its Arrival DLC, the Reapers have staged their invasion and Earth has fallen. Shepard must bring the galaxy together, creating a fighting force to fend off the Reapers once and for all—while dealing with former ally, Cerberus. This page was last edited on 10 July 2016, at 00:25.